Made famous for securing investment on dragons den and selling more bottle of reggae reggae sauce than heinz did tomato ketch up in same week. He now has a full range out and tesco have some great deals available. A list is below. I think Reggae Reggae bog roll is about all he's got left to put branding on now. I think Reggae Reggae bog roll is about all he's got left to put branding … I think Reggae Reggae bog roll is about all he's got left to put branding on now. That article is over 5 years old ... What happened next? He's also a bit dishonest. His recipe is not his Grandmothers recipe. "Questioned about the sauce being his grandmother’s recipe, Mr Roots admitted that was untrue. He said: ‘I was trying to create the flavour my grandmother used to cook for me. How she used to do what she called relish.’"
"This was not merely a claim which fails because it was misconceived," said the judge. "Rather it was a claim which was advanced in circumstances where, to the knowledge of the defendants, they had no proper basis for advancing it. "I question whether the recipe was ever secret in any real sense at all. "I came to the conclusion that I could not safely rely upon the evidence of the first or second claimant [Bailey and Williams] or the first defendant [Roots]." He's also a bit dishonest. His recipe is not his Grandmothers recipe. … He's also a bit dishonest. His recipe is not his Grandmothers recipe. http://www.dailymail.co.uk/news/article-2062308/Reggae-Reggae-sauce-millionaire-Levi-Roots-admits-I-lied-Dragons-Den.html"Questioned about the sauce being his grandmother’s recipe, Mr Roots admitted that was untrue. He said: ‘I was trying to create the flavour my grandmother used to cook for me. 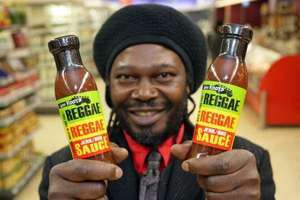 How she used to do what she called relish.’"http://www.guardian.co.uk/law/2011/nov/25/levi-roots-wins-legal-battle-reggae"This was not merely a claim which fails because it was misconceived," said the judge. "Rather it was a claim which was advanced in circumstances where, to the knowledge of the defendants, they had no proper basis for advancing it. "I question whether the recipe was ever secret in any real sense at all. "I came to the conclusion that I could not safely rely upon the evidence of the first or second claimant [Bailey and Williams] or the first defendant [Roots]." Gosh, are you telling me that the marketing spiel of a consumer food brand might not be completely true? Goodness, so the history of the brand theme might be a bit embellished? You'll be telling me Phileas Fogg wasn't a real person next! I hate this sauce, much prefer the traditional Encona sauces, and there are loads of other better West Indian hot sauces. Gosh, are you telling me that the marketing spiel of a consumer food … Gosh, are you telling me that the marketing spiel of a consumer food brand might not be completely true? Goodness, so the history of the brand theme might be a bit embellished? You'll be telling me Phileas Fogg wasn't a real person next! All I'm saying is don't be fooled by this guy. It's all marketing spin, including sticking up for the hard-working factory worker. All I'm saying is don't be fooled by this guy. It's all marketing spin, … All I'm saying is don't be fooled by this guy. It's all marketing spin, including sticking up for the hard-working factory worker. I'm not fooled by him at all. I see a guy who understands how consumer branding works and saw a gap in the market. He then got off his **** and with a considerable amount of balls and a huge amount of luck got his brand to fly. Good for him! I did try his sauce once when it was on a deal in Tesco and thought it tasted bland and generic, nothing like as good as I can make myself. So, like any brands marketing "story", I don't buy it. What I also see, whenever Levi Roots pops up, is a lot of nasty bitter jealousy. It seems the Brits hate rather than celebrate "poor boy makes good" tales. Too many people in this society would rather criticise other peoples successes than get up off the sofa and try and have a go themselves! Deal posting newbie! This is ash_james20 first deal post. Help out by leaving a posting tip or just to show your appreciation for their contribution.